My name is Nyri Bakkalian—that’s “Nyri”, rhyming with “fiery.” The greater Pittsburgh area has been my adopted home for nearly a decade. My favorite guilty pleasure: Coffee snobbery. Turkish-ground Nicaraguan or Yirgachefe with a pinch of cardamom, please. This might fall outside the usual realm of superheroes, but I’d say favorite superhero is Master Chief John-117, from the Halo series. Inasmuch as he’s often simply seen as a genetically engineered super-soldier who can simply plow his way through anything, the man is complex and carries a great deal of pain and loss. Notions like home and family are also something he seems to grapple with throughout the Halo series’ long story arc. I suppose because of my own life, I find this especially relatable. You’d better believe that I cried at Cortana’s “Welcome home, John” line at the end of Halo 4! My favorite book is The Passing of the Armies, by Joshua Lawrence Chamberlain. Chamberlain was a professor who became a soldier in the American Civil War, and he was probably the most highly educated man in the entire Army. The book, written at the tail end of his life in the early 20th century, was his way of trying to make sense of the war’s end, and of what the war as a whole meant. Chamberlain’s lingering horror at war, and grief at the loss of comrades, is also clearly apparent. If I could learn to write those kinds of words—that can move people to tears even a century later—I think I’d be one hell of a writer. “First Light at Dawn” is about challenges and the power of steadfast presence and love. Kate Davis is a former veteran pilot in the US Air Force, and lives in New York with her girlfriend Bree Wilkins, a librarian at the New York Public Library. In the form of a coming-out email, Kate fills in her old college friend, Hannah, about the changes that have happened since they last spoke. Kate has left the military to pursue transition, continues to grapple with PTSD, and tries her best to re-acclimate to life in the US. It isn’t easy, and some days are rough, but the struggle is more than worth it. And Bree’s love for Kate, scars and all, is a steady thread woven throughout this tale. First Light at Dawn, like a lot of the fiction I write today, is motivated by my desire to write the trans representation I want to see: people who are strong, complex, loving, loved, and—scars and all—whole. Nyri A. Bakkalian is a queer Armenian-American and adopted Pittsburgher. 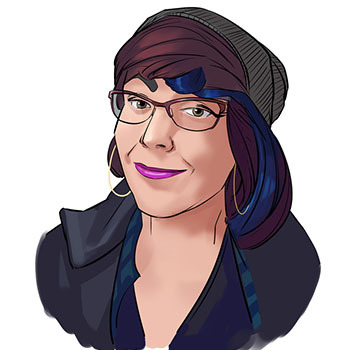 A military historian by training, she’s an artist and writer whose work has appeared on Inatri, Metropolis Japan, Gutsy Broads, and Queer PGH. She has a soft spot for local history and unknown stories, preferably uncovered during road trips with her girlfriend. Nyri can most often be found sketching while enjoying a good cup of Turkish coffee. Nyri blogs at sparrowdreams.com, and is on Twitter at @riversidewings.